Week 5 of the Kansas high school football season saw four teams ranked No. 5 lose and fall out of the rankings last Friday night. Let’s find out how our voters have adjusted the rankings in each classification as we continue through district play. Top-ranked Derby broke the 60-point mark for the second time this season with a 60-7 win over Salina South. The Panthers will travel to Hutchinson (1-4) this week following a home game with Haysville Campus (3-2) before a looming showdown with Maize that should decide the AVCTL-I title. Lawrence Free State rolled to a 51-0 win over Sedalia Smith-Cotton. The Firebirds defense registered its fourth shutout in five games in holding the Tigers to 83 yards of total offense. Smith-Cotton is traditionally a strong Missouri program, but have struggled to a 2-4 start this year after finishing 9-1 a season ago. Manhattan remains in the No. 3 spot in this week’s poll after a 41-14 victory over Emporia. The Indians are well in control of the Centennial League race, but will travel to rival Junction City this week in the battle for the Silver Trophy. Olathe North rebounded from the loss to Columbine (Colo.) with a 35-14 win over Olathe South. The Eagles rushed for more than 450 yards in the win led by Daymonn Sanchez’s 265-yard, three-touchdown night. The Eagles have a big Sunflower League contest this week against Shawnee Mission East. On Thursday night, Topeka High gashed Topeka Seaman for 586 rushing yards in a 62-21 win. The Trojan’s were led by Ky Thomas who rushed for 305 yards and three touchdowns, while Jacqez Barksdale added 223 yards and four scores. Wichita Northwest accepted the challenge of Kapaun Mount Carmel’s highly-touted defense and ripped the Crusaders for 442 rushing yards. Breece Hall ruehed for 204 yards and four scores and caught a touchdown pass as Northwest won 55-26. Second-ranked St. Thomas Aquinas rushed for more than 430 yards in picking up a 53-7 Thursday night win over Blue Valley West. Aquinas sophomore Tyron “Tank” Young rushed for 176 yards and five scores putting over the 1,000-yard mark for the season (1,045 yards) with 16 touchdowns. Maize stays at No. 3 after an impressive 27-2 victory over a Goddard team that was ranked in Class 4A. The Eagles surrendered their first points of the season in the game – although the safety came when a Maize running back was tackled in the end zone after catching a screen pass. The Eagles will take their tour of the Salina schools in the next two weeks before a Week 8 showdown with Derby. Bishop Carroll remains in the No. 4 spot this week after surviving a road trip to Great Bend with a 36-33 win. The Golden Eagles scored twice in the fourth quarter to rally from a 12-point deficit. Great Bend drove to the Carroll 6-yard line late in the game, but settled for a potentially game-tying field goal attempt that missed wide left. Finally, De Soto enters the Class 5A rankings for the first time after a 38-12 win over Spring Hill. The Wildcats lost several starters off of last year’s team that was ranked second most of the season in Class 4A, Division I. Coach Brian King has De Soto reloaded and unbeaten after five weeks behind a defense that is giving up less than seven points per game. Bishop Miege remains in the top spot despite a 14-13 loss to Missouri-power Rockhurst. The Stags scored with six minutes remaining and tried to surprise Rockhurst with a two-point conversion attempt, but Sam Pedrotti was tripped up short on the play. With Miege’s 29-game win streak over, the Stags will look to start another streak at Blue Valley. McPherson stays in the No. 2 spot after a 46-7 victory at Buhler. Senior quarterback Kyler Hoppes passed for three touchdowns and rushed for two more scores to lead the Bullpups. Third-ranked Pittsburg traveled to Ulysses on Saturday and beat the Tigers, 41-6. Ty Roark passed for 250 yards and four touchdowns, while Dylan White had more than 160 yards and three receiving scores. The Purple Dragons will host Mill Valley this week. A couple of Frontier League opponents round out the top five this week. Paola registered its fourth shutout of the season with a 42-0 homecoming win over Baldwin, while Louisburg enters the poll after a 34-0 victory over Eudora. Goddard drops out of the poll this week after a 27-2 loss to Maize. Top-ranked Andale had little trouble in a 56-0 victory over Wichita Trinity. The Indians will now host rival Wichita Collegiate who enters having won four straight after a season-opening loss to Wellington. Sabetha rolled to a 49-7 road victory at Hiawatha. This week, the second-ranked Bluejays will try for a third-consecutive win against Big 7 rival Holton. Scott City surrendered its first points of the season as Russell connected on a touchdown pass in the first quarter, but the Beavers went on to a 56-7 win. Scott City will travel to Beloit this week. The Beavers and Trojans met in the Class 3A state semifinals in consecutive seasons in 2012 and 2013. Scott City won the 2012 meeting 42-26 before capturing the state title over Silver Lake a week later, while Beloit won the 2013 meeting 36-13 before being blown out by Silver Lake in the title game the next week. Pratt rolled to its third consecutive shutout and fourth of the season with a 42-0 blanking of Kingman. The Greenbacks grabbed a measure of revenge as Kingman won last year’s district meeting, 39-25, keeping Pratt out of the playoffs. Perry-Lecompton broke a halftime tie with Santa Fe Trail by scoring 22 points in the second half. The Kaws were, once again, led by Dalton Kellum who rushed for 235 yards and two scores on 24 carries. Top-ranked Phillipsburg cruised to a 45-0 victory over Thomas More Prep. The Panthers led at halftime, 38-0, thanks to a 52-yard field goal from kicker Jonathan Hunnacutt. 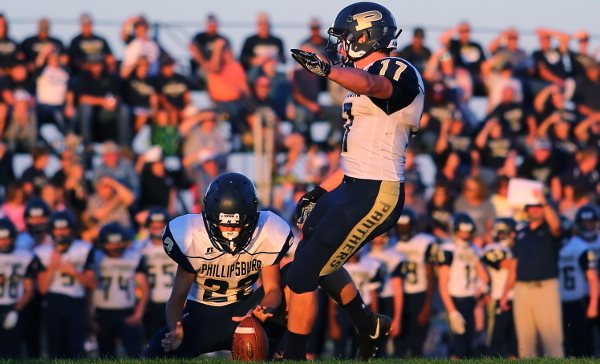 Hunnacutt is closing in on the state record for career kicking points. Silver Lake moves up one spot to No. 2 this week after a 75-0 blowout of Central Heights. In their two district games, the Eagles have scored 131 points while giving up six. The voters drop Conway Springs one spot to No. 3 this week despite the Cardinals’ 62-14 win over Wichita Independent. Conway Springs will be heavily favored in this week’s game against Whitewater-Remington before district showdowns with Chaparral and rival Garden Plain. Speaking of Chaparral, the Roadrunners stay in the No. 4 spot this week after a 48-22 win over Whitewater-Remington. Chaparral rolled to 48 first-half points behind four total touchdowns from Jake Burke. Remington scored all 22 points in the second half. Garden Plain drops out of the top five after a 20-7 loss to Hutchinson Trinity. The Owls’ loss opens the door for Riley County to enter the poll for the first time. The Falcons dominated a district contest with previously unbeaten Mission Valley, 56-0. Top-ranked Smith Center scored 21 points in each half in beating Oakley, 42-0. Redmen legendary coach Roger Barta was inducted into the Kansas State High School Activities Association Hall of Fame at halftime. Olpe stays at No. 2 this week after rolling to a 48-6 win over Uniontown. The Eagles led 41-0 at halftime in notching their fifth win of the season. Olpe begins district play this week against Leon-Bluestem. Elkhart picked up a 47-6 victory at Meade to improve to 5-0. The third-ranked Wildcats were led by Lane Whisennand who accounted for 347 yards of total offense and five total touchdowns. Fourth-ranked Centralia scored twice in the final 4:15 to overtake Troy, 36-22. The Panthers will travel to Northern Heights this week. Finally, Jackson Heights moves into the poll at No. 5 this week. The Cobras grinded out a 22-14 victory over Valley Heights. We have a new No. 1 in Class 8-Man, Division I as Hoxie lost 64-30 at Saint Francis. The Indians stop Hoxie’s win streak of 12-straight games. Hoxie won the 8M-I state title last season, but lost to Saint Francis, 16-8, during the regular season. Hoxie has lost nine consecutive games to Saint Francis. Hoxie falls out of the top five this week, while Saint Francis enters the poll at No. 4. Central Plains takes over the top spot after rolling past St. John, 46-0. The Oilers will travel to Pratt this week to take on Skyline (1-4). Hodgeman County moves up one spot to No. 2 with a 56-6 win over South Gray. The Longhorns have played a difficult scheduled with their first four opponents having a winning record. After this week’s matchup with Kinsley, Hodgeman County closes out the regular season with Spearville and Ness City in consecutive weeks. Clifton-Clyde moves up a spot to No. 3 this week with a hard-fought 54-30 win over Victoria. The Eagles jumped out to a 24-0 lead only to see Victoria rally to within 30-18 at halftime. Clifton-Clyde opened the third quarter with a touchdown pass to regain momentum in the game and ultimately take control of the district. Finally, Solomon gains only enough votes to remain at No. 5 despite a 74-26 victory at Bennington. Logan Krause scored six total touchdowns in helping the Gorillas roll past the Bulldogs. This is the second time Solomon has been passed by a team entering the rankings as the Gorillas have not yet caught the attention of each voter on our rankings team. There are no changes in this week’s Eight-Man, Division II top five as each of the five teams rolled to big victories. Hanover topped Onaga, 66-0, to set up this week’s showdown with No. 5 Axtell. The Eagles also reached the 60-point mark by blanking Wetmore, 60-0. Osborne stays in the No. 2 spot after a 54-6 halftime win over Logan-Palco. Darrien and Darnell Holloway each rushed for a pair of touchdowns to lead the Bulldogs to their third straight win. Third-ranked South Barber beat Norwich, 54-8, to set up a key non-district game at No. 4 Otis-Bison this week. The Cougars have taken control of District 8 after a 58-12 win over Minneola.